Last Updated: July 18, 2013 by Jackie R.
A report from Jackie R., an Academy Apprentice, about the 2013 Bucktails field school. 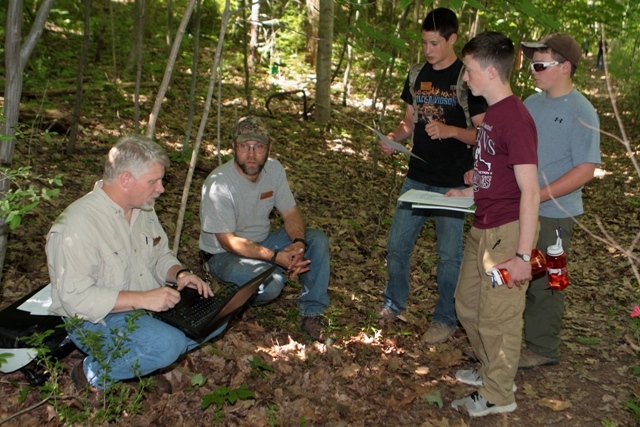 Bucktails students in the field learning about deer population assessment from PA Game Commission biologists. The Wildlife Leadership Academy PA Bucktails field school is upon us again. The cadets have been working intently, instructors have been teaching passionately, and knowledge is flowing through the minds of all in attendance. I am privileged to once again be a part of this intensive wildlife conservation academy, no doubt the best of its kind. Although my years as a student no longer exist, the program has not ceased to develop and inspire me. As I observe and assist the new students of 2013, my mind flashes back to when I first learned the difference between a White Pine and an Eastern Hemlock and to when I first mustered up the strength to fire a shotgun at my first field school in 2010. Since the year 2007 the program has continuously developed ambassadors for wildlife conservation and this year is no exception. This very week, as the torch of inspiration is passed to a new group of students, the driving force for the preservation and conservation of natural resources will gain 18 new members.